This entry was posted in Linux, UrBackup Server by admin. Bookmark the permalink. does urbackup detect by itself that it can use btrfs? 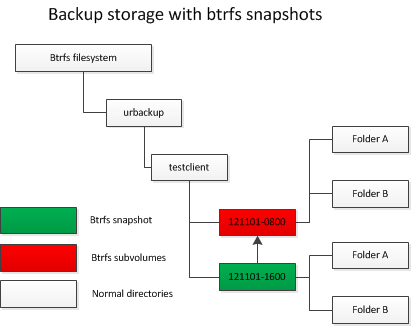 I did enter the path to the backup to /etc/urbackup/backupfolder, ran the test-script wich was ok, but then, how do I tell urbackup to use btrfs snapshots? And how do I check whether it does? to check if it creates btrfs subvolumes.